I've read a lot of Self Improvement books in the last 10 years and I've come to realize that while there are a lot of good books on the subject, there are also a lot of bad ones that are often written by unknown authors. I had never heard of Cameron C. Taylor before and didn't think much of his book but decided to read it anyway and I was pleasantly surprised by it. Cameron C. Taylor did a good job at identifying the 8 Attributes of Great Achievers and backed his finding up with good examples from great men in history. The book took me about an hour to complete and , while the information was powerful, I would of liked for each attribute to be expanded more. I like to know about the author personal experiences when I read Self Improvement books and I didn't feel like Cameron talked enough about himself. The Self Improvement field has a lot of books and, after reading them for a while, they all feel the same. 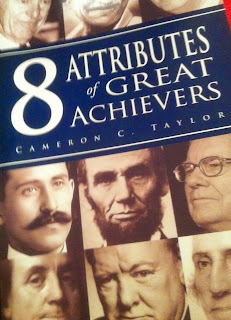 "8 Attributes of Great Achievers" was a book that stood out for me and I recommended to you.